When Tiffany Dasher's daughter, Briella, was born, the unexpected happened. Following an uneventful pregnancy, Dasher, a Madison County resident, expected a rather routine labor and delivery, but shortly after birth, Briella was placed on oxygen and a heart monitor. Later, Briella was also equipped with a gastrostomy tube, or g-tube. 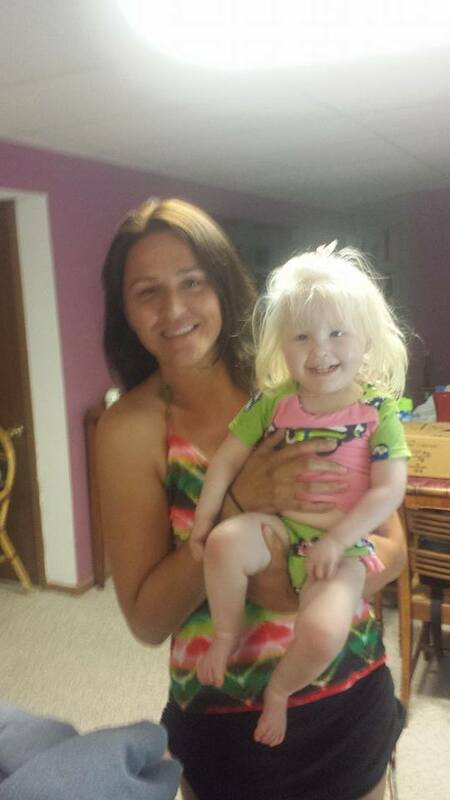 Now, at 22 months old, Briella has a Prader Willi Syndrome diagnosis. As a result, she faces battles with hypotonia, feeding and breathing issues, obstructive sleep apnea, and possible heart complications. "The days after Briella's birth were overwhelming to say the least," Dasher states. "She was unable to take her food by mouth, and she was attached to a steady stream of machines. We did not know what to do or what to expect." It was then that Dasher was directed, by the medical team at Cardinal Glennon hopsital, to Early Intervention (EI). "EI was our beacon of hope for Briella," she said. EI provides therapy services to children from birth through three years old who have special needs and developmental delays. Through EI, many children close developmental gaps before they reach school age, which results in less money spent on future special education costs. Darcy Armbruster, a Cook County Physical Therapist, has worked in EI for 3 years. "The services offered through EI include physical, occupational, speech, feeding, and developmental therapy in addition to social work services, care coordination, adaptive equipment, and vision and hearing therapy. Some of these services are only available to kids in Early Intervention and cannot be utilized at outpatient therapy clinics through the traditional insurance route," Armbruster explains. 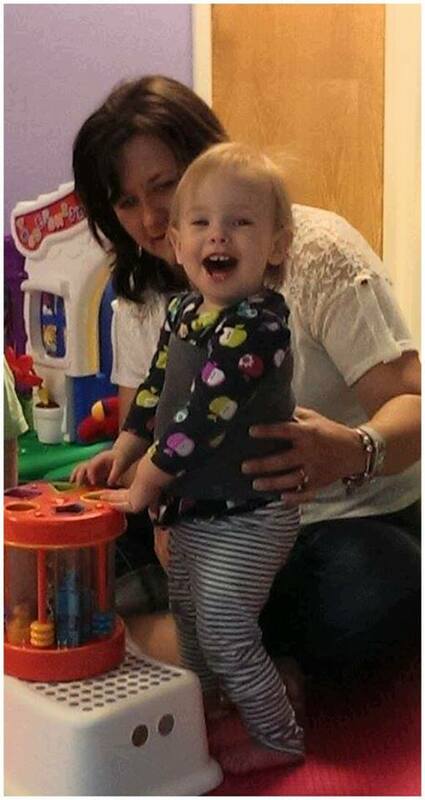 Dasher's daughter utilizes many of the services that EI provides. "When Briella started EI, she was severely delayed," says Dasher, "but now, with the help of developmental, physical, occupational, and speech therapy, she's crawling, climbing and walking with assistance. She even feeds herself and signs to communicate with us. She just gets a little stronger each week." Thirty minutes away, in St. Clair County, Nicole Pederson relates to Dasher's experience. Pederson's son, Jackson, was born 13 weeks premature and faced a slew of medical complications ranging from anemia to brain hemorrhages. "Prior to EI, all we had to go on was what the doctors thought and what the books on premature child outcomes said. The list was endless: Autism Spectrum Disorder, Attention Deficit Hyperactivity Disorder, behavior problems, severe delays, and learning problems. I feared my child wasn't going to have the same experiences as his cousin who is just 6 weeks younger. I worried that my son was going to struggle and that he would be left behind," Pederson states. Like Briella, Jackson receives multiple services through EI, and he has made tremendous progress. Pederson says that when Jackson began in EI, he had a 70% delay across the board. "Now, he is between 40–20 % delayed," Pederson says with a smile on her face. "He has made clear strides through the help of EI. His texture and food aversions have dramatically decreased with the help of occupational therapy. 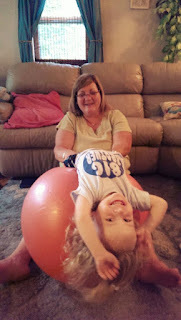 His core strength and ability to be mobile has increased due to the help of physical therapy, and even though we have just started with speech therapy, he has drastically improved his vocabulary and vocalization." According to advocates, approximately 20,000 families in Illinois receive therapy through EI—Briella and Jackson are just two of them. Currently, families' insurance, along with a monthly family fee, pay for much of the EI services that children need, but some additional funding also comes from the state. Without a budget, EI therapists, families, and children remain in limbo. Many parents fear that these services will slowly become less accessible. For Jackie Bruns, of Madison County, this fear has become a reality. Bruns' son, Trae, has a syndrome that causes global developmental delays. When he started in EI, he was 100% delayed and received most of the many services that EI offers. Echoing the sentiments of Dasher and Pederson, Bruns attributes the accomplishments that Trae has made to EI. "The progress is amazing," Bruns says, "Every day it's something new—from doing a new task, to climbing the stairs, to crawling and pulling up." However, Bruns knows that without a budget, Trae's days in EI are numbered. "One of his providers told us that come August, she may no longer be able to continue seeing Trae due to this budget impasse," Bruns explains. When asked what she will do when Trae's services stop, Bruns pauses for a moment. "We would have to seek out a different provider who would have to start from scratch with him," she says, "As this budget impasse continues, I think it's going to get harder to find therapists, especially ones who have working knowledge and experience with my son's syndrome and feeding issues." Bruns takes a moment to collect her thoughts and continues, "Potentially, we may have to find a clinic to take him to, and his immune system is already compromised, so being around those germs would be detrimental to him." 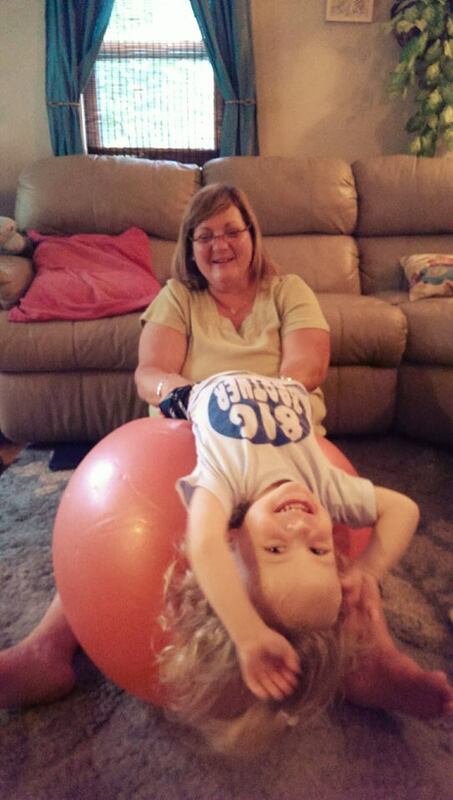 EI therapists come into the family home and work with both the child and the family. The therapists serve as individual contractors with the state and often pay for the equipment and toys that they utilize during therapy sessions. They also regularly wait months to be compensated by the state for services they have previously provided. During this budget impasse, therapists have been encouraged to continue to provide services, but they remain in the dark about when or if they will be paid for the services that they currently provide. Armbruster agrees with Bruns' worry that therapists will begin to pull out of EI as the state waits on a budget. "Companies will begin to shift away from accepting EI cases," Armbruster states, "and they will move toward more of a clinic-based private insurance model." Armbruster says the unfortunate ramifications of the budget impasse will likely force kids to sit on waiting lists for months or longer to receive the services that they need. "Services like assistance with transitioning into the special education system and developmental therapy are not available through private insurance, so fewer children will be able to benefit from theses services," says Armbruster. "The bottom line comes down to providers and companies needing to pay their own bills so they can survive," Armbruster states. Lynn Barts works as a Social Emotional Consultant for Child and Family Connections -- which serves as the point of entry for families and individuals wanting to make a referral for EI. Barts stresses that therapists must give a 30 day written notice that services will be stopping. "This written notice allows Child and Family Connections ample time to locate other therapists who can provide services and fulfill the individualized family service plan," says Barts. Pederson acknowledges the unfortunate decision her son's therapists are faced with, "Our providers have been extraordinary so far through the budget impasse. They fear not being able to put food on their own tables, and yet, they have not given up on my child and have said they will continue to work with us for as long as possible." If the budget impasse continues, Pederson is fully aware that her son’s therapists may have to stop services in order to be able to provide for their own families. "If Jackson loses his services because of the budget impasse, it would be devastating," Pederson claims. 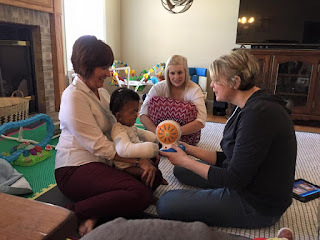 "While each of his therapists is providing crucial help for him to close his developmental gaps, we would be forced to have to decide which therapies were the most important, as we could not afford all the services he needs without the help of the state." Barts encourages families to contact their legislators and share their personal stories. "Family stories are what will make a difference from my perspective," Barts says. Armbruster has one message for the legislators and Governor Rauner, "Birth to three years old is the most important window in a child's development. These children will never be birth to three again; please don't make them miss out on the services they need." Like Armbruster, Dasher has a request as well, "Hear our stories in person, and see who you are affecting by not agreeing on a budget. While EI helps our children meet milestones, it also brings amazing and caring people into our children's worlds. With no budget, our children are also potentially losing some important people in their lives— their therapists." The other night, I stood in front of a crowd and explained why we needed to end this budget impasse. Later in the evening, as I stood by the stage looking out at the audience, I noticed something that spoke to my heart: my own daughter, Ceci, who has been in EI since she was four months old. She wasn't right at my side, and she wasn't with her dad or her sister. She was in the arms of her amazing physical therapist. Not because she had to be there, but because that's where she wanted to be. In that moment, I was reminded of the incredible bonds and connections our children and therapists have because of EI. We must ensure that these bonds stay intact. Our children should not have to suffer nor sacrifice due to political actions or inactions. But they are. ﻿"Imagine these children as if they were your own children or grandchildren," Pederson pleads to Rauner and lawmakers, "More importantly, imagine if you had a child with special needs and you did not have a six-figure salary. What would you do?" Each day that passes without a budget leads to more questions like Pederson's and less answers. How long will lawmakers make EI therapists wait to be compensated for the invaluable services they provide daily to children in our community? How long will families be forced to wait to get their children the services they so desperately need? How long are leaders willing to allow babies to suffer? This is such a heartfelt blog post. I am the owner of a pediatric therapy practice that services Early Intervention clients on the north side of Chicago. The amount of referrals that have been sent out in the past month via our CFC's email referral list (and resent out if the case has not been picked up) has increased dramatically. Clearly, the service coordinators are having a harder and harder time finding therapists to fill cases. It is so sad to think how many children like the children whose stories you have shared are not receiving services. This is a link to a petition I created to urge Illinois to pass a budget. Each time it is signed, a letter is sent to Bruce Rauner, Michael Madigan, and President Obama.